Right next door to the Emporium shopping mall and BTS Phrom Phong is Sukhumvit Soi 24. This long, straight road extends from Sukhumvit all the way down to Rama IV and is chocka-block with hotels, apartments and restaurants. Thanks to the large volume of apartment buildings down here, and the proximity to Bangkok’s central business district, Soi 24 is a very popular road with expats and professional Thais. 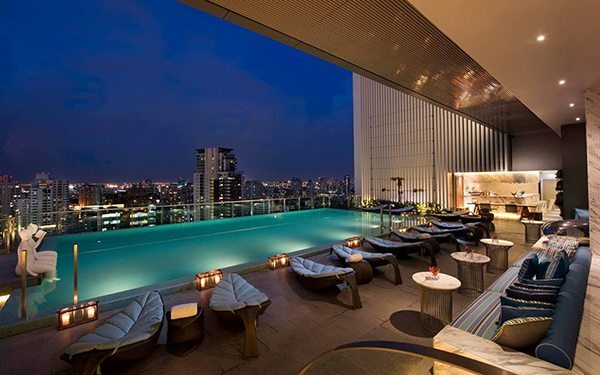 The Sukhumvit branch of the well-known international Hilton hotel chain is incredibly popular with tourists looking to base themselves in the heart of Bangkok. There are an array of luxury rooms and suites on offer, including executive room if you’re interested in enjoying lounge access. Hotel amenities include a fitness room and swimming pool, currency exchange, concierge and a multi-lingual staff. They’ve also got a number of restaurants and bars, including the brilliant Mondo. Checkinn99 is an iconic cabaret bar and jazz club that recently relocated to the Admiral at 24 Oakwood from it’s previous Nana location. Their Music Of The Heart house band are legendary, while the Sunday afternoon jazz jams see the whole capital’s musical talent come together and entertain. Just as the name suggests, Veganerie is a vegan bakery and cafe at the start of Sukhumvit Soi 24, behind Benjasiri Park. Indulge in everything from red velvet cakes to smoothies and special vegan breakfast. Theta State is one of a couple of float centres in Bangkok that allow you to experience total sensory deprivation and potentially enter the Theta State. This is great for meditation and relaxation, and has even helped ease and heal physical injuries. They have four private spa rooms and you can choose either float rooms or pods, with the former being well suited to those who suffer from claustrophobia. With a huge red lobster hanging off their signage, you won’t be able to miss the entrance to the popular Seafood Market on Soi 24. Sporting the motto of “if it swims, we have it”, they have a huge array of seafood to choose from which is prepared in a variety of styles for you. They also have VIP rooms available for up to 250 people each, and a garden venue for outdoor events. Adjacent to the huge President’s Park apartment complex is Lebanese restaurant, Nadimos. This Soi 24 branch is one of three branches throughout Thailand, including one in Koh Samui. These 5* luxury apartments are a full service haven which are decked out with complete kitchens and bathrooms, used as both a short-term hotel and even longer-term Bangkok accommodation. Marriott Executive Apartments also have a lot of leisure facilities on hand, including a 200 square foot gym, swimming pool, racquet clubs and even a golf practice area. They also have a tuk tuk shuttle service.